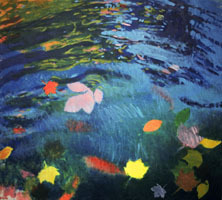 This is a reproduction of an original oil painting called Koi Pond. There is a great horticultural garden near me which has two ponds filled with large orange koi fish. I went there on a fall day, so the leaves became part of the image also. The leaves also flattened the image onto the picture plane. When I painted, I used positive and negative stencils for the leaves, which I had made previously from real leaves. Using the stencils, it was interesting to think ahead about which areas would be covered and left bare. Since I paint in semi-transparent layers, this would create many in-between colors (e.g., first a wash of blue; then put a positive leaf stencil down, and paint the area around it in yellow ochre. The leaf shape will be blue, and the surrounding area will be an olive green. Then using a negative leaf stencil, create an orange leaf shape over the olive green. And so on... with various negative and positive shapes around the canvas.) This forces me to calculate what is going to happen with the color - or just try something and see what happens. Stencils can be left on for several color applications; more than one stencil can be used at a time, etc. It is great to experiment.